PlayPatch: Kids Fun & Games app: insight & download. Welcome to the Bean&Gone™ PlayPatch! PlayPatch is designed for kids 4+ (Preschool and older) and their parents and siblings to enjoy together! 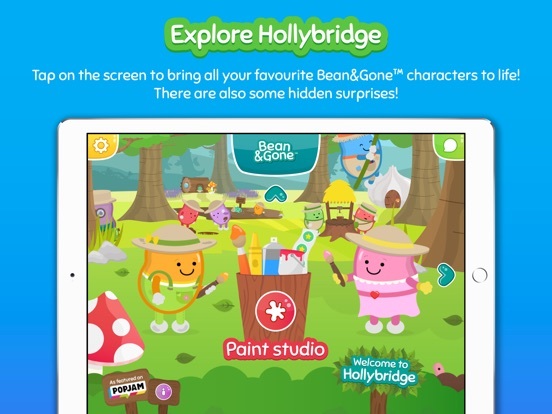 A fun app for all the family to enjoy, starring all your favourite Bean&Gone™ characters! Featuring fun colouring sheets, videos, games and puzzles. And its all free! Explore the magical world of Hollybridge and beyond with Jim, Jess, Morton, Basil, Fern, Blossom, Farmer Fred and Farmer Frieda and a supporting cast of thousands! Includes 12 Bean&Gone™ colouring sheets. 2 multiplayer kids card games, Pairs and Snap! Multi-touch painting so kids can colour together with friends or siblings and collaborate on competition entries. Always colour within the lines! Paintbrush, Crayon, Spraycan, Fill Bucket & Stamps tools. Each scene comes with its own palette so you can recreate your favourite scenes with the right colours. A huge ever growing library of activity based canvases from our PopJam library. In-app Fan Art submission with a tap of a button. Regular competitions that kids can enter at a tap of a button to win real prizes! Video gallery featuring exclusive Bean&Gone™ sketches featuring all your favourite characters with more added regularly. All this and even more exciting updates coming soon! We take child safety & privacy extremely seriously. Bean&Gone™ PlayPatch™ does not collect any personally identifiable information from your child. All information sent to us is completely anonymous. Thank you so much for downloading our first Bean&Gone™ app. If you like it, a positive review would make all the Bean Team very happy! If you encounter any issues, please not hesitate to contact us at feedback@beanandgone.land. We are very quick to respond and will fix any issues straight away. 27 June 2018 : Free! 26 August 2017 : Free!